Few things are simpler than a snack that goes from freezer to plate in a matter of minutes. Many frozen mozzarella stick products can be microwaved, although they'll be less crispy than those that are oven-baked. While the snacks are made to be easy to prepare, it pays to read the label carefully. Some brands specify that they shouldn't be microwaved. Others do include microwave instructions, but the zapping times vary from one brand to another. Thaw the marinara sauce packet in a bowl of warm water, if the sauce is included in the mozzarella stick package. Do not microwave the packet, and allow at least six minutes for the sauce to come to room temperature in the water. Arrange the mozzarella sticks like spokes on a wheel, evenly covering the surface of the plate. This configuration will help the sticks cook at the same time. Do not cover the sticks. Place the plate in the microwave and prepare to cook on high heat. Microwave the sticks on one side for 25 to 45 seconds, if there are fewer than 10, or 45 to 60 seconds for a plate holding 10 or more sticks. Use tongs to flip each of the mozzarella sticks over. Depending on the package directions, microwave them for an additional 25 to 45 seconds if there are fewer than 10, or 45 to 60 seconds for a plate with 10 or more sticks. Open the microwave door and tap the sticks to see whether they feel cold, especially in the middle. If so, cook in 15-second intervals until they feel warmed through. Take the dish out of the microwave. Let them stand for one minute, then serve. 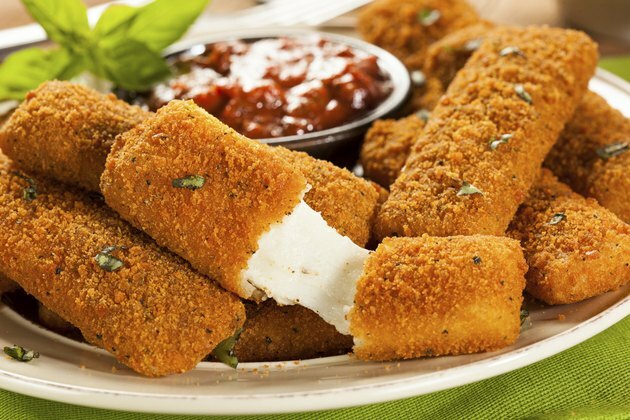 Frozen mozzarella sticks are made to go directly from the freezer to the oven or microwave. Thawing them first can make the crust mushy. Serve the snack with ranch dressing, tartar sauce or salsa. Use caution when handling and biting into microwaved food. Meals like mozzarella sticks can become extremely hot, especially when they are just out of the microwave. Tongs are helpful for flipping or transferring the sticks. Exercise portion control. Two sticks have about 115 calories and 3 grams of fat. Like many frozen foods, they are also relatively high in sodium, with the two-stick serving comprising about 10 percent of your daily recommended amount of sodium.